To open The Breathing Field is to enter a suddenly quiet space. A fusion of poetry and art, this is not a book about yoga poses, but about bridging tranquility from the mat to the page. Its "breathtaking" poems and images create a place of sanctuary in the reader. 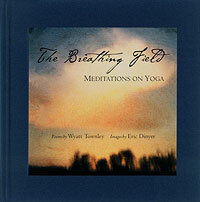 The Breathing Field is an ideal companion for poetry lovers, yoga enthusiasts, and the generally adventurous. Silk cover with tipped-on image • 6.5X6.5"
"A breathtaking collection of poems. Everything about Wyatt Townley's The Breathing Field is outstanding." "This is a beautiful book in all ways: physically, conceptually, and in the poems themselves." "The body itself feels stretched and the breath slows in response to the poetry. For a book to achieve synesthesia is itself a remarkable achievement." "Truly one of the few yoga books I really love." "The Breathing Field is perfection—or as close to it as one can get. What an extraordinary marriage of poetry, yoga, and art!" "The union of author and artist on the page is remarkable; the essence of each poem is exquisitely captured. This is a collection I will treasure."